Please ignore if you already know it. Starting up is a bit scary to some, but on the net are thousands of posts about keeping poultry. There are forums packed with people that know eveything there is to know about chicken keeping and most of it is total handed down clap trap. Firstly and most important of all is how and where you intend to keep them.They need a run and house to live in safe from dogs, foxes and in some areas people looking to have them away. The house needs to be dry and draught free, well ventilated and easy to clean.It needs to be made from treatable timber of a good thickness for insulation from temperature variations in summer and winter. So forget your second hand caravans and anything made from plastic it’s not suitable. Chickens don’t sweat, they lose heat through breathing and regulate their body temperature thus. If the house is badly ventilated they will sit in damp air in which all the viruses they suffer from will muliply in a warm damp atmosphere. So near the top of the house there should be exits for this warm rising air to escape through. As this air escapes cold fresh air should be able to get into the house from near the floor to replace the air thats gone out from the top in that way the birds get fresh air. A house discribed above will be expencive and to be honest I haven’t seen any I’d want to spend my hard earned money on.Most seem to be made by people that have never kept chicken and chickens are birds, not little people with feathers on. Most are made from lightweight timber with cracks and crevices that are perfect for breeding poultry mite. They are, more often than not difficult to get into to clean and worse of all the makers claim that a house will hold a number of birds way beyond the limit that they should be kept in that house. The fastest way to kill a chicken is put it under stress and crowding is top of this list. Poultry keeping takes time and commitment at all levels and what seems to be a 10 minute job each day turns into an hour or more once you have more than a couple of runs with chickens in them to keep clean, fed and watered. Looking after my lot takes about 3 hours a day and every weekend and most evenings when the days are longer, making sure they are comfortable. (Much to the annoyance of my other half), But stock come first before anything. Winter feeding and up-keep is really testing, but has to be done then more than ever.De-frosting drinkers and trying to keep the birds off mud and dry can be a problem. After houseing, one of the most important aspects of poultry keeping is dealing will illnesses and if you are prepared to cull/kill a bird that is sick or injured. A trip to a vet will result in 2 things. A bill that will make your eyes water and 99% of the time a dead chicken, as most vets haven’t got a clue about poultry…cats, dogs,horses,sheep and cattle may be, but take a sick chicken in and it’s a quick look at the ‘Why your chicken is dying’ paragraph in the vets handbook,an injection,possibly some blue powder to be put in it’s water and ‘bring it back if it doesn’t get better’. Being able to deal with an ill bird for the birds sake needs to be thought through, as it will happen. By the time you notice a bird looks unwell, it is probably to late to do much about it.Most of the time it’s internal. The bird appears fluffed up and more often than not it’s eyes are closed. It’s fluffed up trying to keep it’s body temperature up trapping air in the feathers and the body heat warms up the air, so put it somewhere warm and quiet. Do not under any curcumstances worm it, as the last thing it needs while it’s intestines are infected is purging with chemicals. Flubinvet is recommended by people for worming, but if you read the lable it states that if you have worm infected ground you need to re-treat the birds three weeks later, as they will pick up worm eggs from the dirty ground. If the bird has worms you have them in your ground. Use Cider vinegar in the water. Which breed you choose to start with will vary with personnal choice. There are a lot to choose from large and small and some breeds present more problems than others. 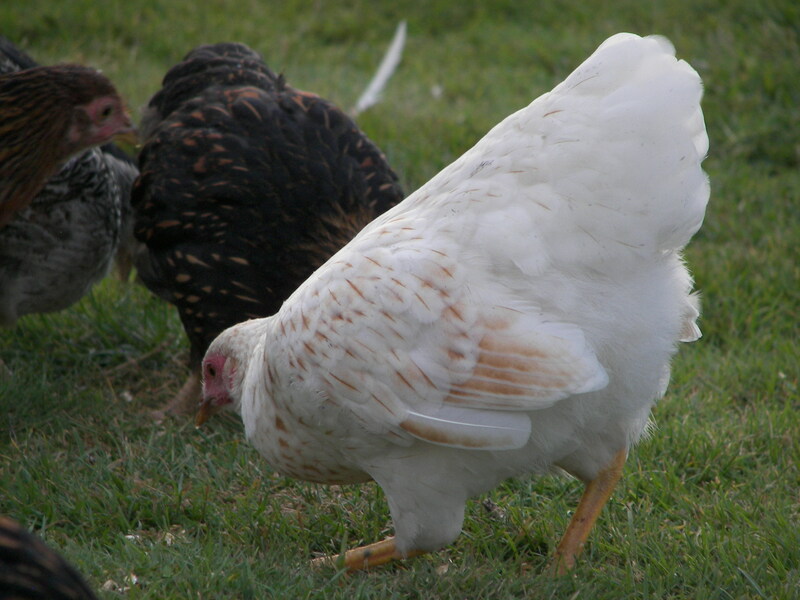 Breeds with excess feathering (Soft feather) will retain wet and mud longer than hard feather breeds. Feathered feet carry a lot of mud around the toes and into the clean coop and if laying onto the eggs. The breeds such as Cochin,Brahmas and Orpingtons are big birds and you will need to allow room to house them. There is so much information on the web and in books I will not bother to blog on about each breeds advantages and dis-advantages. If I was to suggest a breed to start with I should without question go for Wyandotte Bantams. Correct size house/coop/run for the number of birds you intend to keep.